Most kid foods contain too many artificial flavors, pesticides, and preservatives; all while lacking wholesomeness, sustenance, and sustainability. 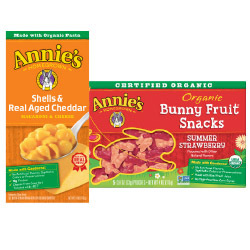 Annie’s products are getting happy taste buds, nourishing ingredients, and environmental friendliness all into the same kid bite. They are making delicious food that kids love to eat, with the wholesomeness parents want to serve. 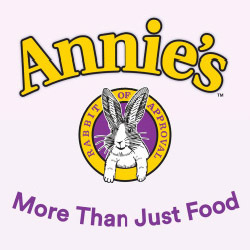 Let Annie’s help you provide better food for your family that is natural and organic. If you’re looking for lunchbox ideas your kids won’t trade, spice things up with some Buffalo Chicken Mac & Cheese, cut veggies and a packet of Bunny Fruit Snacks! 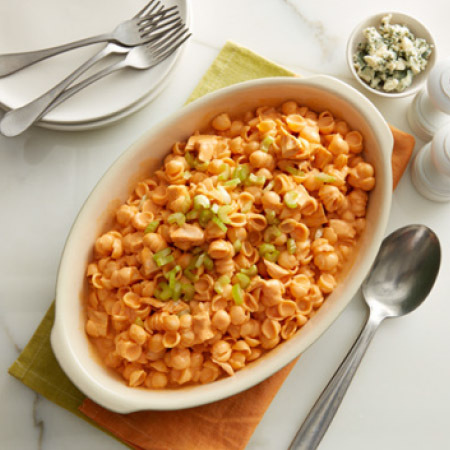 1.In a 3 quart saucepan, make Shells & Real Aged Cheddar as directed on the box, except use 1/3 cup of milk and 1/4 cup of unsalted butter. 2.Stir in chicken and buffalo wing sauce until well blended. 3.Cook over medium-low heat 2-3 minutes, stirring occasionally until thoroughly heated.